I am always looking for a new twist on an old favorite. You can usually find me tasting and tweaking things in the kitchen. This creation is one of those times when I took a slight detour from an old favorite with happy results! 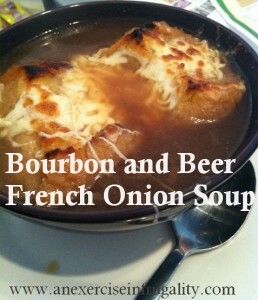 Check out the Bourbon and Beer French Onion Soup! 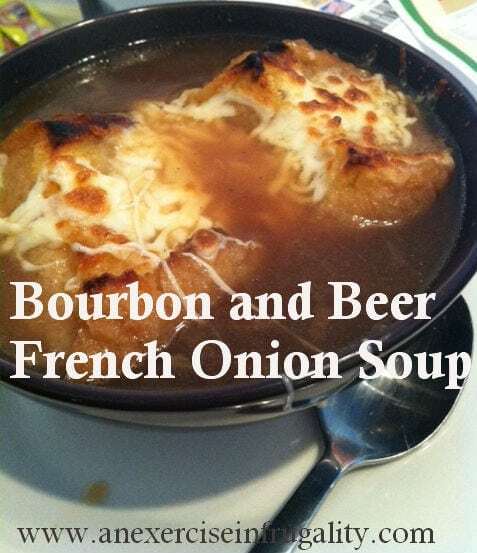 It started out as ordinary french onion soup, but I decided the flavors weren’t quite what I wanted…I needed something more. *note: I wound up adding water to my soup, because as it cooked, it seemed too salty to me, so taste it here and there. I always recommend tasting as you cook to see if it needs to be altered to suit your tastes! Slice onions thinly. Melt butter in a large soup or stock pot. Add sliced onions on medium heat. Stir occasionally until they begin to brown. Onions should be dark brown and very translucent. You will want to watch them closely, but cook for 30-45 minutes. De-glaze the pan with the Jack Daniels, and make sure you get all the brown bits off the bottom of the pan. Add the broth(s), garlic, pepper, Worcestershire sauce and bay leaves. Bring to a boil, add the beer (SLOWLY! It will foam up!) then reduce to simmer for 30 minutes. At this point, taste to see if it needs water added to reduce saltiness. When ready to serve, toast the bread in a 400 degree oven for a couple minutes until nice and golden brown. Put the soup in an oven safe bowl or crock, put the slice of bread floating in the middle, and top with the cheese. Put back in oven to melt cheese, but watch constantly as it can burn quickly. Use caution when removing as the bowl will be HOT. Put bowl onto another plate and serve! 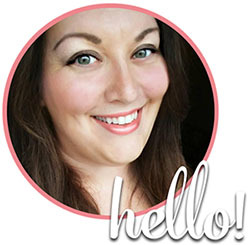 This was featured at the Kitchen Crusader’s February Blog Hop! What do you think of this recipe? Let us know in the comments below! Check out some other frugal ideas while you’re here with the Frugal Pin of the Day! Yikes! Not sure how I missed that…but it is one 12oz bottle of beer. Any kind (probably best to stick to non-flavored beer). Hope this helps!